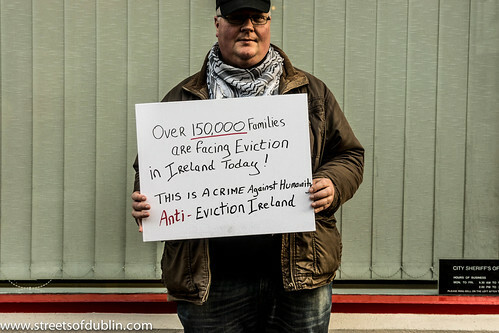 Lone Protester (Anti-Eviction Ireland) - Streets Of Dublin, a photo by infomatique on Flickr. 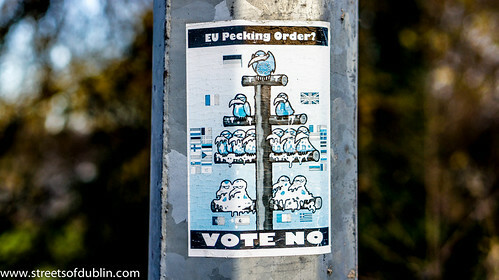 EU Pecking Order Photographed In Newbridge (County Kildare) On Christmas Day 2012, a photo by infomatique on Flickr. 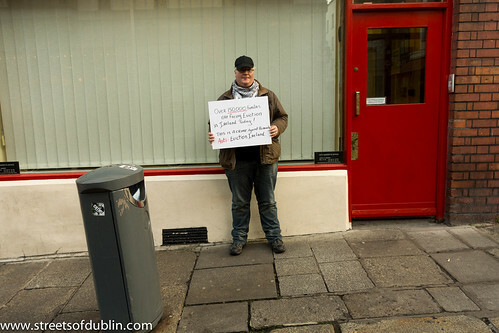 Protesting Outside The Embassy of the Slovak Republic, a photo by infomatique on Flickr. When I photograph an event I try to capture the spirit of the event and I do my best to capture images of those who attend as well as photos of the organizers. 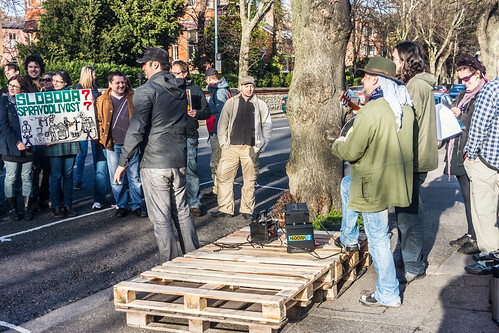 Today (03/03/2010) Slovakian nationals organized a good humored protest outside their embassy on Clyde road. The purposes of the rally was to protest against corruption in Slovakian politics. Initially the organizers were disappointed by the low turn out but they need not have worried as many people did eventually arrive. Clyde Road is not easy to find (if you do not know your way around Ballsbridge) so I am assuming that many had difficulty finding the Embassy. 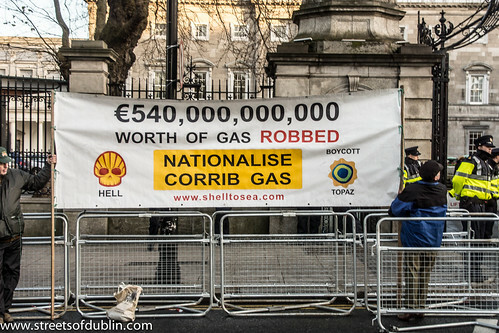 Clyde Road runs from Wellington Place to a junction with Pembroke Road and Herbert Park in Ballsbridge. It intersects Raglan Road, Elgin Road and Wellington Road. It is named after Colin Campbell, 1st Baron Clyde (1792–1863), a Scottish soldier who fought in India during the Indian mutiny in 1857. This was a good opportunity to try out my new Sony NEX-7. This camera allows me to capture high quality video as well as still photographs however in video mode the camera overheated after about two minutes this surprised me as I did not have this problem with the NEX-5. Since its founding by its namesake in 1976, Raymond Weil draws inspiration from major musical works to create elegant and cutting-edge timepieces. Named after the Wagner opera, the signature Parsifal collection balances symmetry and harmony with a powerful, valiant outlook befitting of the opera's hero. The Don Giovanni collection, named after Mozart's comedic opera, blends daring design with advanced technical prowess, and the Don Giovanni Cosi Grande mechanical chronograph is hand assembled by Raymond Weil's finest watchmakers. Over the years, Raymond Weil has introduced a number of other series that helped the company become an enigmatic leader of the Swiss watch industry, including the Othello, with its discreet design that emphasizes strength of character and uncompromising beauty, and the sophisticated, color-stained-crystal Traviata. Stainless steel case with a stainless steel bracelet. Fixed stainless steel bezel. White dial with blue hands and Roman numerals hour markers. Minute markers around the outer rim. Luminescent hands and hour markers. Date display at the 3 o'clock position. Quartz movement. Scratch resistant sapphire crystal. Push / pull crown. Solid case back. Case diameter: 28 mm. Case thickness: 6 mm. Deployment clasp. Water resistant at 50 meters / 165 feet. Functions: date, hour, minute, second. Raymond Weil Tradition Ladies Watch 5966-ST-00300. 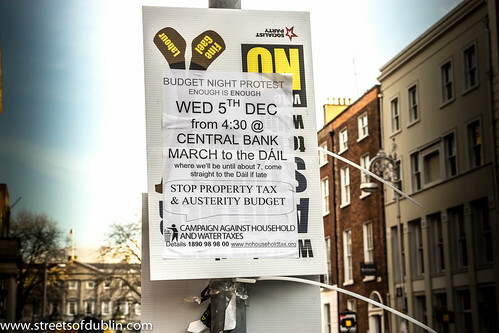 Protest: Budget Day Demonstration In Dublin (5th. December 2012), a photo by infomatique on Flickr.